It has also been importance to us to respond to what the community wants. The project emerged from community comments that they can’t always attend our public talks and free tours. By bringing the archaeology to them, we creatively deliver engagement that suits them, in a way that is feasible for us. … it’s been a lot of work but really rewarding. It’s been great to put into action some of the things that I’ve learned in the lecture hall about public engagement. I was given space to be creative in designing how the trays and the posters looked. I really appreciated the fact that my vision came to light and it has been so inspiring for me as a student to see this project from its first days to where we are now. It really gives me hope for what I can achieve once I’ve graduated. I’m really passionate about people engaging with archaeology, especially here, because residents can be curious about what we’re finding. One of the most common questions I got asked by locals was ‘are you finding anything good?’ This is why I think the Town Museum project is a fantastic idea not just in terms of engagement with the community but also as a project that is student led. Previously … you’d be there for a few weeks and then you’d go away, job done and we didn’t know much more than that. [Now I feel] absolutely more connected. One of the main reasons [to be involved is that] I live locally to where you’ve been digging and it’s just interesting to know what you guys are up to up there. And to be part of displaying some of the artefacts that you’ve been finding I think is good for the local people to know about it, and to be involved as a local person in supporting what you’re doing up there. It’s nice to bring something different to Berkeley, with the history of Berkeley and the castle, it’s definitely good…This is nice because it involves everybody, different businesses, all together. 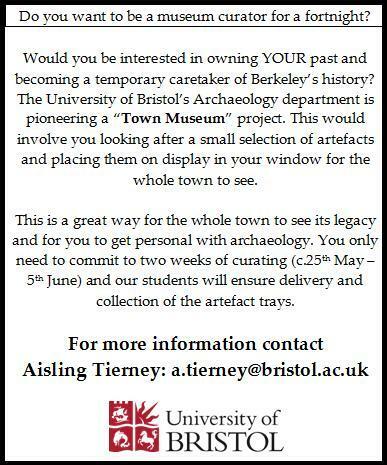 We are delighted that the University of Bristol has engaged with the residents of Berkeley to set up the Town Museum Project this year. It’s wonderful that the students have had such a good response from those living in the town of Berkeley and it’s very reassuring that so many locals were keen to get involved. We always look forward to welcoming the team back from the University each year and to seeing a new group of students, they are always a pleasure to have around. It’s very exciting when the students excavate new areas, their discoveries tell us more and more about the history of Berkeley and of course, the Castle itself! It’s also a great added attraction for our visitors, we really appreciate that the University team are happy to provide guided tours of the excavation area and its associated finds, to those who are interested in finding out more about the site. Do you think the skills encountered on this project will help your future career prospects? Do you plan to include this experience on your CV and in interviews? Did you enjoy engaging with the local community? If you had the opportunity, would you partake in a similar engagement effort again? Would you recommend this experience to other students? Further evaluation of the responses is underway and there are lots of plans to further develop engagement at Berkeley in the 2016 season! Over two weeks, the town of Berkeley was transformed into a museum where the community became temporary curators of their own past. 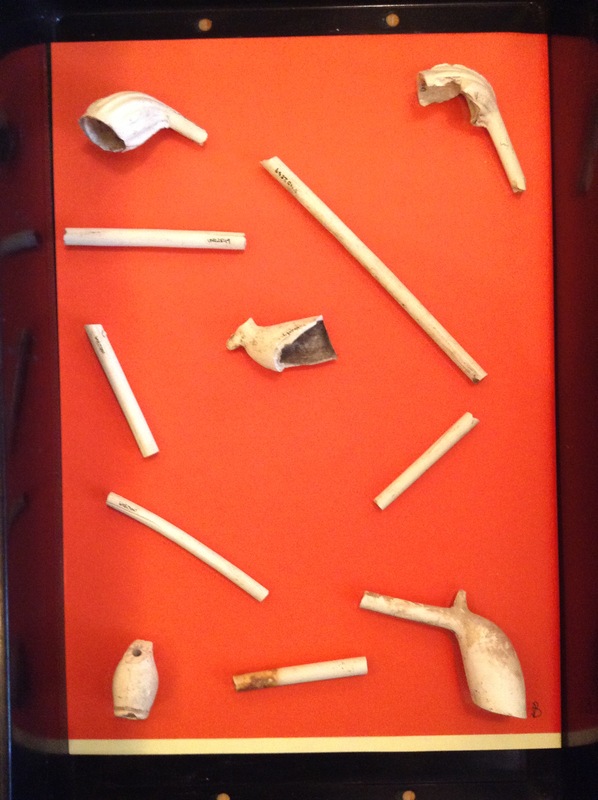 The Town Museum project proved to be an effective way to bring archaeology into community life at Berkeley. The community were pleased to be so actively included within our research efforts and applauded the project vocally. Local businesses also saw the project and associated media coverage as a means to promote their business and support the local economy. 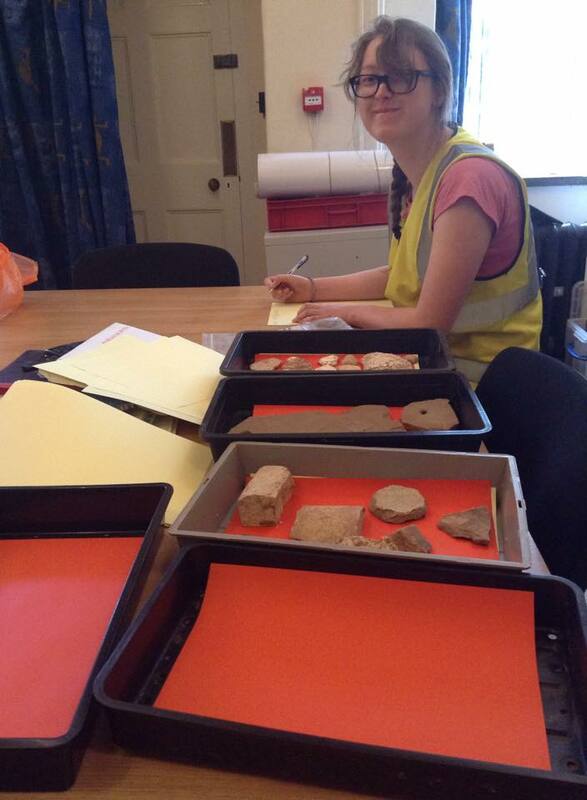 The community also improved their knowledge of history, archaeology of their local area, and artefact analysis. All stakeholders benefited from the project. Berkeley Castle were delighted to be able to share their history within the community, so as to enhance community relations, which is a priority for them. They also welcomed the possibility of increased publicity of their heritage site.The research efforts of the Department were showcased to great effect in a public venue. Students developed an extensive range of transferable engagement-related skills, from communication to time management, and also enjoyed the experience. They valued the trust placed in them to lead the project and invested much personal time. Likewise, the community valued the trust given to them to become temporary curators of the artefacts. The project outcomes and impacts are sustainable as they directly relate to the ongoing engagement efforts tied to the BCP. The BCP will continue for years to come, and students have a three year track record of electing to volunteer their own time to the Engagement Team efforts that sit alongside this, setting a precedent that is likely to continue. Talks are in place to identify funding streams to support her coordinator post for future years.Outcomes and impacts were publically shared via the BCP social media channels the University even covered the story in a press release: http://www.bristol.ac.uk/news/2015/may/town-museum-project.html. Interest poured in from multiple directions online, and the Museums Association and Culture 24 also got in contact to cover the project. The project serves as an adaptable example of good engagement practice that can be shared widely across the University and the wider HE sector, including subject areas beyond archaeology (e.g. Engineering, Geography). 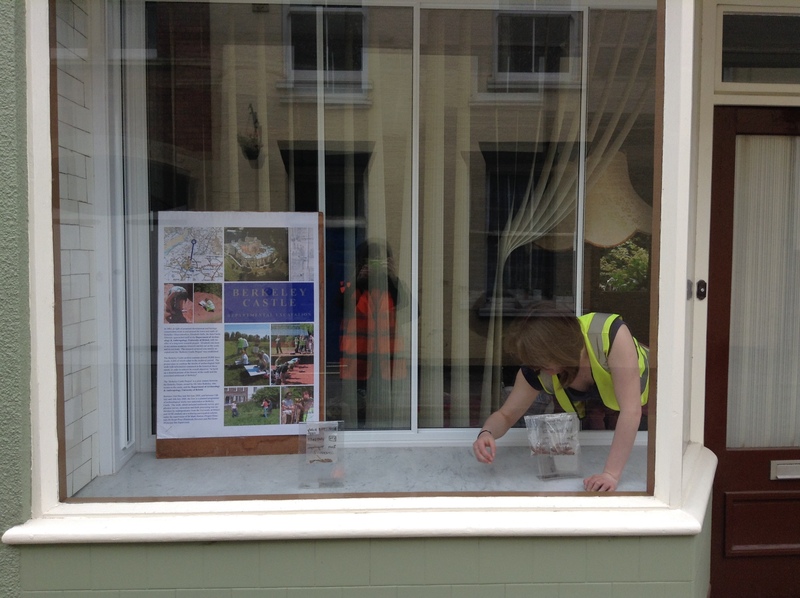 June 2015: The Town Museum Project Gets Going! On the first day of the season, Bristol students went door to door around the town of Berkeley to post dig-related information through letterboxes, including information to email regarding the Town Museum project. We received some responses, but it was only when our students went door-to-door around the community and chatted with people that we achieved a larger response. After just one day, twenty locals signed up formally to the project. The community responded enthusiastically to the opportunity and were eager to get involved. 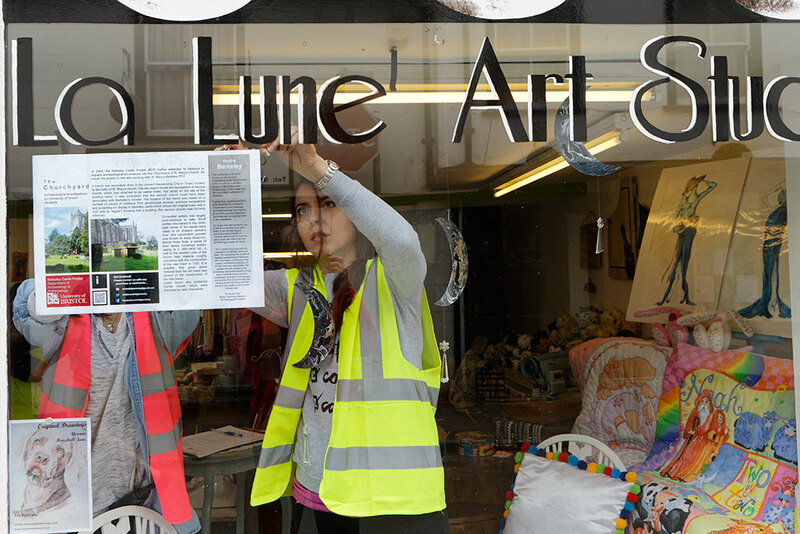 They loved the idea of becoming temporary curators of their own past, hosting artefacts and archaeological information in their windows. And it’s not just private residences that are getting into the project – a range of businesses have signed up too! For me, it is also about trust. The community trusting that we have the best intentions to work with them and that we actively want to include them. The University trusting our students to work with our principle heritage stakeholder, Berkeley Castle. The academics trusting the students to produce a good exhibition. And us trusting the community to take care of the artefacts. Community is built on trust and we want to foster a sense of community and genuine collaboration. As an academic institution, we have an obligation to share and communicate our research with the public – what better way to than to place them at the centre of it, physically! In preparation for the project, students on the engagement team have individually number labelled each find that will go on display, over 250 finds in total!The labelling process is time consuming but ensures that finds won’t get lost or incorrectly re-catalogued. Students are placing finds in small collections on coloured pieces of paper in normal finds trays (essentially garden supply seed trays). The collections showcase the variation within the archaeological assemblage over multiple periods of occupation at Berkeley. Students are also designing information sheets that will be displayed alongside the finds. All stakeholders take something positive away from the experience. In a teaching respect, this type of skills building and improved confidence is crucial for our students. Berkeley Castle facilitate better community relations and share their history. And the University gets to take its research knowledge into a public and highly accessible setting. 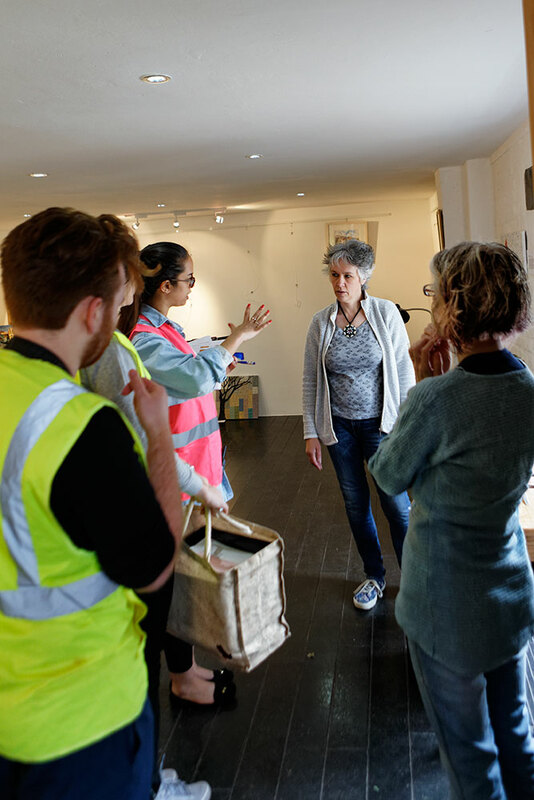 The community who host the displays get the chance to be keepers of history and share artefact handling sessions, while those not directly involved get to walk around the town and benefit from the displays. An ambiance of archaeology is created alongside the excavation at the castle. As I write, the project is underway and we plan to bring the completed trays to the community next week. We’ll photograph and number the trays for our records before they go to each house. The participants will also sign a short agreement with us to take care of the objects. 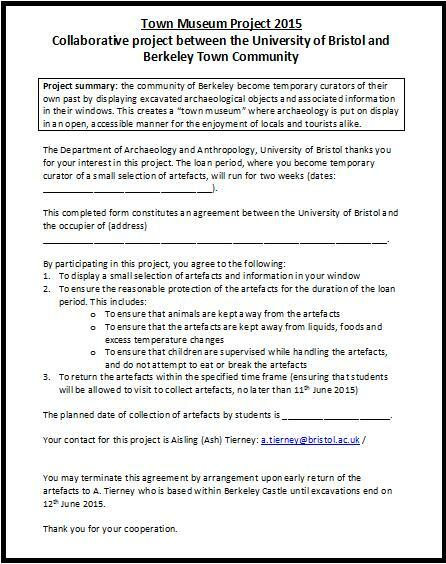 This project could be a really great model for other University excavations, or even longer term commercial work – so keep checking back for more updates as we go!